So, you want to be a consignor? Register with our system. Consignors (even returning ones) MUST register with the system to receive a consignor number. We need to know that you are participating as well as verify your address and consignor information. There will be a limited number of consignors allowed for each sale, so we recommend that you register as soon as possible. You may consign a MAXIMUM of 200 clothing items per sale and 8 pairs of QUALITY shoes per sale. We are limiting books to 25 per seller. No limit on other items. You set the price! You decide how much your items sell for and if you want your items to discount! You receive 65% of the selling price! Each consignor will be charged $10.00 as a participation fee to help cover advertising costs. HWGA provides the easiest registration and tagging system around. Track your inventory, seeing what has sold, and for how much! Barcodes are printed right on your tags, no stickers to stick, just print 8 tags per sheet! See Merchandise Preparation for details. HWGA reserves the right to deny any items. 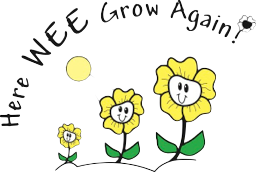 Here Wee Grow Again inspects all items brought into the sale, assuring only the best quality! Consignors who consign at least 25 items will receive 1 pre-sale pass for shopping from 10am-6pm on the day of the charity event! You may bring a friend if they pay the $5 entry to one of our three chosen charities! We will have any of your unsold items sorted and ready for pickup after the sale. You will need to pick up your check from the church following the sale. You will be notified of when they are ready. Visit our Merchandise Preparation page for detailed information on how to prepare your items! You MUST register on-line to participate. Once you have registered with our online registration system and have received your consignor’s number, you will need to FAMILIARIZE YOURSELF WITH THE LINKS AT THE TOP OF THIS PAGE. NOTES: It may be necessary to limit the number of consignors. Therefore it is recommended that you register as soon as possible.